The advantage camouflage CS-DV4 Mini DV Camera Case from Portra Brace is designed to protect and organize the camera and the essential spare battery, tapes and microphones. It fits popular cameras such as the Sony PMW-EX1, HVR-V1U, HVR-Z1U, HDR-FX1, Canon XH-A1, XH-G1 and the Panasonic HVX-200. The cradle inside is adjustable and stays put to keep the camera from shifting. The case is made from 1000 denier Cordura nylon with a generous coating of polyurethane waterproofing, plus 1.0" thick foam padding. The bottom panel is reinforced with 8.0mm hollow core plastic, foam layers and a layer of Slip Not fabric, which adds an extra layer of protection against water, dirt and grime with an easy wipe-off surface. The CS-DV4 has a large exterior pocket for cables and an optional rain cover, a wide slip pocket for white balance card, owner's manual, maps airline tickets, etc and one small padded soft pouch. The case is carried by a removable, adjustable, suede shoulder strap or dual suede carrying handles. Wide slip pocket for white balance card, owner's manual, maps airline tickets, etc. Box Dimensions (LxWxH) 22.0 x 14.0 x 9.5"
CS-DV4 Mini-DV Camcorder Case (Advantage Camouflage) is rated 4.8 out of 5 by 56. Rated 5 out of 5 by Anonymous from well made; one small complaint These Porta Brace bags are thoughtfully designed & well constructed for the Pro camera user. I just have one small complaint: the bag bottom, although 'waterproofed' does in fact sit on the dirty ground or floor or airport or wherever you drop it. I also have an English Billingham camera bag, and those bags have 'feet' - little brass risers - that lift the bag off the muck. I'm surprised Porta Brace doesn't include this feature in their bags. Otherwise, superior construction, made in USA & all the other great comments that owners post about Porta Brace. This bag also fits perfectly in the overhead compartments on airplanes. Rated 5 out of 5 by Rod from Porta Brace Never Disappoints There are certain brands that you pretty much know what to expect in terms of design, function and quality of materials and workmanship. This case fit the pattern. If you need a solution for transporting and storing your Camera, I recommend this one. I needed it for my Sony PMW-EX1 and it had to fit in the overhead as a carry-on when I fly. If you over stuff it, you will have trouble fitting it in the overhead, so keep that in mind. Rated 3 out of 5 by Uthred from Expensive and not very versatile Bag is very stylish and well constructed, but I ended up returning it because it simply does not offer a lot in terms of storage compartments, or dividers to keep pieces of equipment from touching. If it did not come with the camcorder cradle (which does not really hold the camera in place as well as I expected), you would not think this bag was for any type of photo or video equipment. It was more like a more sturdy duffle bag, but not as sturdy or as padded as I would like for housing a video camera. This bag is great if you only want to store your camera and maybe a few extra items (documents, filters, batteries, etc.). But I would not recommend this for housing other equipment such as mics, lights, or other lenses. Rated 5 out of 5 by Anonymous from Pro bag for pro equipment Great fit for the Canon XF 300 with some room to spare for gear. Padded sides and bottom provide excellent protection and outer material is very tough. Stands up to being stuffed in overhead compartments on airlines and does not have to be treated with care. I would like for the camera cradle to be a bit larger but since it velcros to the bottom anywhere it works fine. I have had a smaller Porta Brace for many years and it has never showed signs of wearing out. Rated 4 out of 5 by Guest from Nice case but missing a part Porta brace makes nice cases. This is a good case only it was shipped with a small part missing. Basically a Velcro strap which holds the camera in place. I have replaced it with some Velcro I bought, but would appreciate if B&H could send out a new part. I already sent them an email. 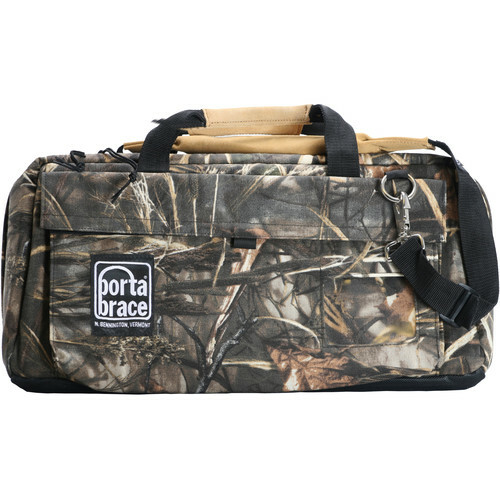 Rated 5 out of 5 by Anonymous from Versatile Case PortaBrace gear is simply awesome. This case fits that description. Built like a tank with thoughtful features, including well-designed internal pouches, a large central gear compartment, the awesome reconfigurable camera tray, high-quality hardware all around, included white balance card, and lots of storage possibilities. I bought this to use with a Panasonic HMC40, and it's great. The case is large enough for the camera and my audio and support accessories for an all-video event, or the camera, a few accessories, and a DSLR for stills for a mixed-mode shoot. Rated 5 out of 5 by Jon G. from Great case for Sony FS7 I was looking for a carry-on case for the Sony FS7. Even though this does not show that the camera will fit, I had an almost identical Portabrace case that I tried first to see. Works great and I know it can go on-board in cabin. Need to remove arm and viewfinder. Plenty of room to leave mounted in case on Zacuto VCT universal plate, base plate, batteries, charger, a lens or 2, mike, etc. Just what I needed at a good price. Can this be a carry on bag for an airplane?